Sharon C. Glotzer is the Anthony C. Lembke Department Chair of Chemical Engineering, John Werner Cahn Distinguished University Professor of Engineering and the Stuart W. Churchill Collegiate Professor of Chemical Engineering, and Professor of Materials Science and Engineering, Physics, Applied Physics, and Macromolecular Science and Engineering at the University of Michigan in Ann Arbor. She is a member of the National Academy of Sciences and the American Academy of Arts and Sciences, and a fellow of the American Physical Society, the American Association for the Advancement of Science, the American Institute of Chemical Engineers, the Materials Research Society, and the Royal Society of Chemistry. She received her B.S. degree from the University of California, Los Angeles, and her Ph.D. degree from Boston University, both in physics. Prior to joining the University of Michigan in 2001, she worked for eight years at the National Institute of Standards and Technology where she was co-founder and Director of the NIST Center for Theoretical and Computational Materials Science. Professor Glotzer’s research on computational assembly science and engineering aims toward predictive materials design of colloidal and soft matter, and is sponsored by the NSF, DOE, DOD and Simons Foundation. Among other notable findings, Glotzer invented the idea of “patchy particles,” a conceptual approach to nanoparticle design. 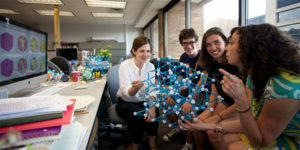 She showed that entropy can assemble shapes into many structures, which has implications for materials science, thermodynamics, mathematics, and nanotechnology. Her group’s “shape space diagram” shows how matter self-organizes based on the shapes of the constituent elements, making it possible to predict what kind of material—glass, crystal, liquid crystal, plastic crystal, or quasicrystal—will emerge. Glotzer runs a large computational research group of 35 students, postdocs, and research staff, and has published over 200 refereed papers and presented over 300 plenary, keynote and invited talks around the world. She has provided leadership and input on roadmapping for federal granting agencies on many research topics, including simulation-based engineering and science, and three of her reports are among the first six references cited by the Materials Genome Initiative. She serves on several boards and advisory committees of the National Science Foundation, the Department of Energy, and the National Research Council. She is a Simons Investigator, a former National Security Science and Engineering Faculty Fellow, and the recipient of numerous other awards and honors, including the 2016 Alpha Chi Sigma Award from the American Institute of Chemical Engineers, 2014 MRS Medal from the Materials Research Society and the 2008 Charles M.A. Stine Award from the American Institute of Chemical Engineers. Initiated in 1958, the distinguished Reilly Lectureship at Notre Dame is perhaps the oldest continuing endowed lectureship in chemical and biomolecular engineering in the United States. The lecture series is supported by the Peter C. Reilly Fund, which was established in 1945 in honor of the late Peter C. Reilly, a former University Trustee and recipient of an honorary LLD degree. Each Reilly speaker gives two talks in the lecture series; one for a general audience and a technical talk. The Reilly Lectures now occur annually each spring. See a list of past Reilly speakers here.